Yum yum yum !. I love Meat Pie. Not a very elegant name and somewhat misleading as the pie consists mostly of various vegetables. 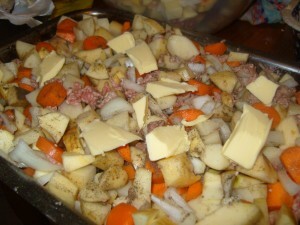 Mom makes it in the winter and I’ve started too as its a perfect winter meal.The recipe we use is my Grandmas. This is a traditional recipe among the Finns in Northern Michigan. 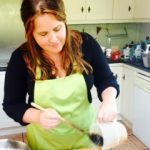 The quantities I’m using below provide about 25 portions . Now I know you are going “what! how much” but hey its yummy and freezes well and is so inexpensive and yet healthy ( well kinda healthy if you ignore the butter). The pasties are great for lunches, picnics and dinner, and I have happy kids at the moment as they’ve had pasties for school lunch all week. Scrub the vegetables and peel the swede (you can peel them all but I dont bother) Cut all the veg into cubes abut 1cm square. Put them in a bowl and cover with water and leave to soak for a few hours . This is to keep the pie moist. You can skip this step but the pie is drier. Drain the veg and mix in the mince and salt and pepper. Thats it, filling made. To assemble the pie : Fill a pie pan with the filling mix, dab some butter on the top and the cover the filling with your pastry of choice. We use a butter pastry but you could also use a suet or lard pastry. Cut slits in the top of the pie. Bake at 160 for 1 – 1/12 hours . keep poking the centre of the pie to check if the veg are done . I also put a loose piece of tinfoil across the top of the pie to prevent the top from overcooking. You can also brush the top of the pie and pasties with beaten egg. Serve with a good tomato chutney or relish or as the kids do, ketchup. 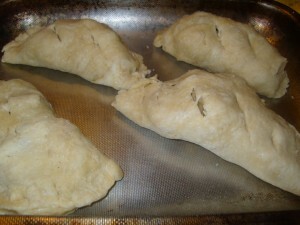 For pasties: roll your pastry into circles and put filling on one side of the circle. brush water around the edge of the pastry. 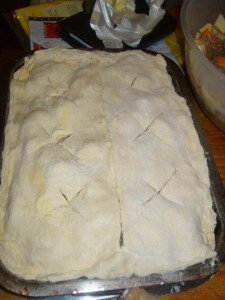 flip the other side of the pastry over and crimp the edges. Cut slits in the top. Bake for about 40 mins. 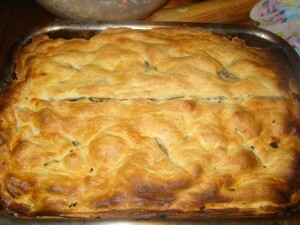 This made two big meat pies with 8- 10 portions each and sixteen medium size pasties. 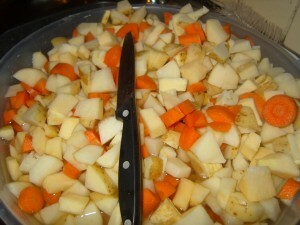 You can vary the vegetables used and the amount and type of meat added . Its a flexible recipe. ( Don’t tell Mom I said that). Replace 1/2 the beef with ground pork. Try it with lamb mince and maybe some rosemary. Add some chopped courgette. We made one where we whizzed the veg up a bit more finely, added the mince, some chard, allspice, lots of black pepper, some raisins and some flaked almonds to make a kind of cross between a medieval dish and a pilaf. That was very tasty too. You can freeze the ready made pies or pasties, cooked or uncooked, or just freeze the filling.